Are you a Blogger? Reviewer? Interviewer? I’ve created this page for you. It contains information about my most recent release as well as social media links, author photos, author bios of various lengths, and a Q&A (that can be found HERE) that you’re welcome to use. Please feel free to contact me or my assistant Rachel for further information or with any questions. Stella Faye Emory has known a life of loss. Orphaned at the age of eleven, she is sent from her home at the Biltmore Estate to become a companion for a wealthy family in Boston. As she grows into a kind and talented young lady, a benefactress recognizes Stella’s artistic skills and funds her education but Stella’s fame as an illustrator inspires jealousy and an unwanted rumor that sends Stella fleeing back to the Biltmore. James Craven is the second-born son of an automobile tycoon. Following his family to their new estate in the Blue Ridge Mountains, James finds his place among the forests and mountains of the countryside. When his little sister is saved from drowning by the mysterious, “Faye”, James’ interests take a new turn in the direction of this fairy-like artist who seems to appear and disappear at the most unexpected times. As James and Stella’s friendship deepens, Stella’s past finds her and threatens her newfound romance. Can a charm bracelet and an unanticipated visitor restore hopes for a happily-ever-after? Experience a touch of magic with these four fairytale-ish novellas that span over one hundred years. Linked by an illustrated book of fairy tales, each novella is an enchanting combination of a beloved classic sprinkled with the author’s own brand of fairy dust. Stairs and Stardust is set in 1913 Asheville, NC at the beautiful Biltmore Estate and includes a budding children’s book illustrator, an out-of-the-box heir, and a teensy bit of Cinderella romance. Entanglements has a Rapunzel twist and is set in 1920’s Boston between a reluctant heiress, a charming piano tuner, and a game of chess. Twice Upon A Time is a Beauty-And-The-Beast inspired tale that brings a romance novelist back home to her family’s pecan farm… and the ex-fiance she left behind. Once Bitten is a nod to Snow White that includes a fake date with a handsome woodsman, seven geeks, and the world’s best apple tarts. Option 1: Pepper Basham is an award-winning author who writes historical and contemporary romance novels with grace, humor, and culture clashes. She’s a Blue Ridge Mountain native and an anglophile who enjoys combining her two loves to create memorable stories of hope. You can connect with Pepper over at her group blog, The Writer’s Alley, her website, Facebook, Instagram, Pinterest, or Twitter. Option 2: As a native of the Blue Ridge Mountains, Pepper Basham enjoys sprinkling her Appalachian into her fiction writing. She is an award-winning author of contemporary and historical romance, mom of five, speech-language pathologist, and a lover of Jesus and chocolate. She resides in Asheville, North Carolina with her family. You can learn more about her on her website, www.PepperDBasham.com or connect on Facebook or Twitter. Pepper Basham is an award-winning author who writes romance peppered with grace and humor. She currently resides in the lovely mountains of Asheville, NC where she is the mom of five great kids, a speech-pathologist to about fifty more, and a lover of chocolate, jazz, and Jesus. Her Penned in Time historical romance series has garnered recognition in the Grace Awards, Inpsy, and the ACFW’s Carol Awards, with The Thorn Healer, recently listed as a finalist in the RT awards. Her contemporary romance novels, A Twist of Faith, Just the Way You Are, and Charming the Troublemaker have received high ratings from Romantic Times, with Just the Way You Are as a Top Pick. Most recently she’s introduced readers to Bath, UK through her novellas, Second Impressions and Jane by the Book, and taken readers into the exciting world of WWII espionage in her novella, Façade. The second novel in The Pleasant Gap series, When You Look at Me, arrives in October and her contribution to Barbour’s wonderful My Heart Belongs series hits the shelves in January 2019 with My Heart Belongs in the Blue Ridge. 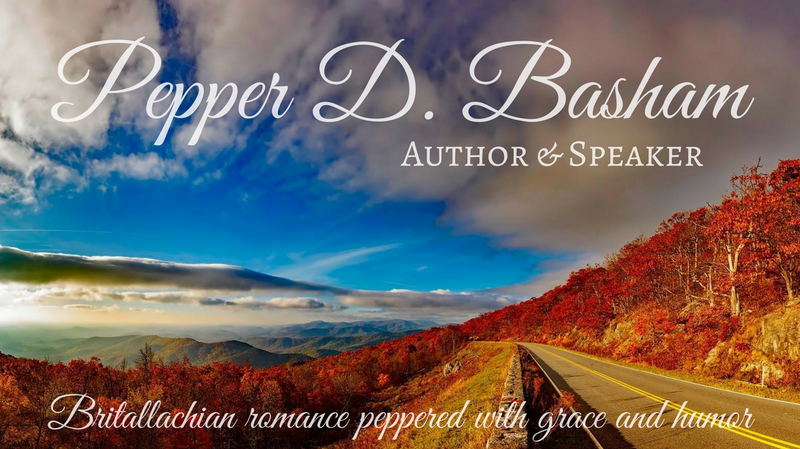 You can get to know Pepper on her website, www.pepperdbasham.com, on her group blog, The Writer’s Alley, Facebook, Instagram, Pinterest, or Twitter.